My kids love ice cream cakes, but have you ever seen the insane price they go for. There is just no way I can get one of those often. But the kids love them, and really, so do I. I knew there had to be a better way to enjoy an ice cream cake, be able to have them at picnics and just for a special dessert and not feel like I was wasting half of my grocery budget on our yummy treat. 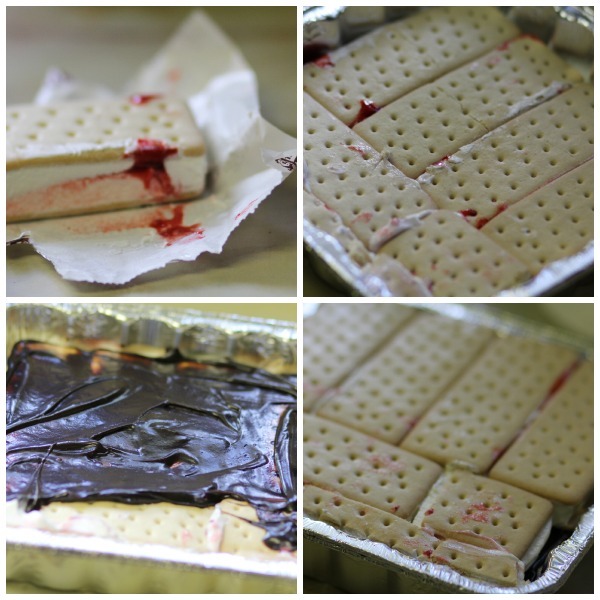 That is when I went over to a friend’s house and she was making her own ice cream cake for a picnic. Using ice cream sandwiches. And yep, you better believe I have been doing it ever since. 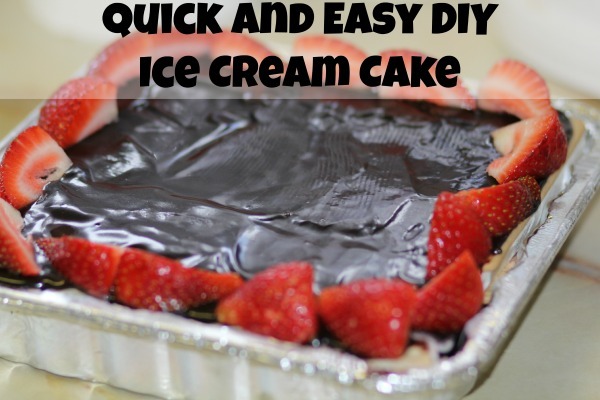 What I love about this ice cream cake is how simple it is to make, but also how simple it is to change things up. 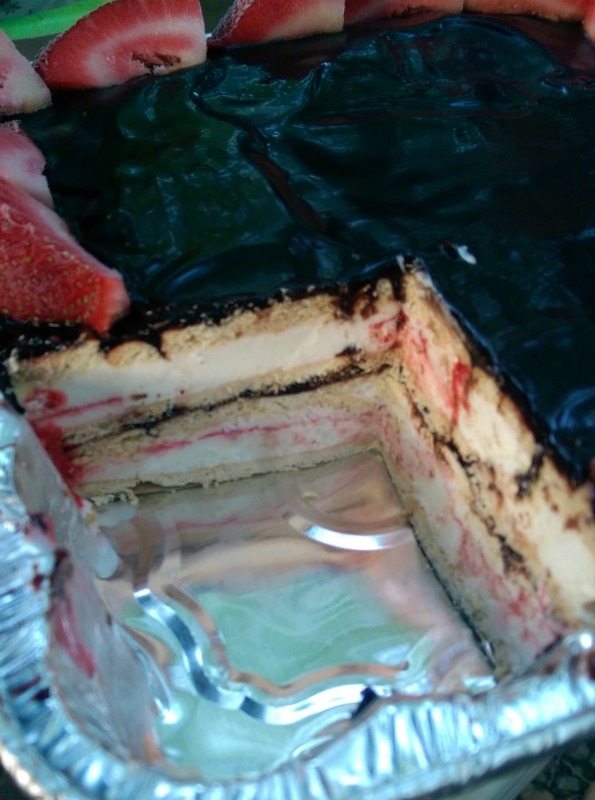 I normally make the ice cream cakes with plain ice cream sandwiches but for our picnic I found a limited edition Strawberry Cheese Cake Ice Cream sandwich. It added a bit of variety to my ice cream cake. I have seen a lot of different flavors in ice cream sandwiches, so the possibilities are endless. I prefer to use an aluminum disposable pan. I use something to decorate the top with. Sometimes it is candy, sometime icing flowers. I decided on Strawberries for this one to go along with the strawberry cheesecake ice cream. Layer the first set of ice cream sandwiches. I have found, depending on how the sandwiches are made, you sometime get 1 layer or 2. My normal chocolate ones make one layer because they are thick but shorter. My strawberry cheese cake sandwiches are thinner and longer. If you have one layer, just ice over the top. If you have 2 layers, I like to put a layer of icing between them. I like the pan to be completely full, so I will cut a sandwich to fill in spaces. It is completely up to you how you like it. Frost over the top. 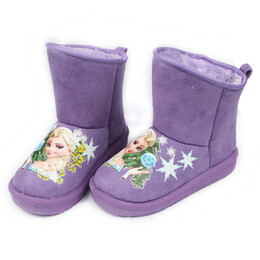 Add it into the freezer to harden everything up. Before serving, add on your decoration. You can do it before, but remember it will freeze that too. So it really depends on how you like it and if you want it frozen. Candies are usually ok, frozen strawberries are not my thing. Just cut up and enjoy. Everyone will be loving your treat, and no one will no just how easy it was to make. Unless you tell them.